Now is the time to enhance your inbound marketing strategy. 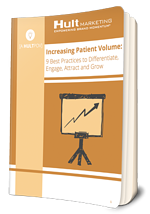 Stay one step ahead of your competitors by downloading our free eBook - Increasing Patient Volume: 9 Best Practices to Differentiate, Engage, Attract, and Grow. Discover and define your differentiation to drive increases in patient volume; competitively position your ophthalmology practice in the marketplace; focus on internal Brand delivery through employee adoption; and, learn how to grow your practice's volume through ROI-based website and digital marketing strategies. Simply fill out the form on this page to get started!